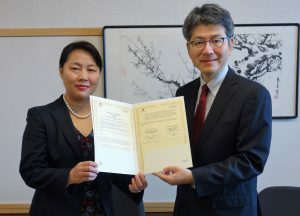 On November 8, 2018, GraSPP signed a Memorandum of Understanding (MOU) with the ASEAN+3 Macroeconomic Research Office (AMRO), a regional macroeconomic surveillance organization established in 2011 with the aim of contributing to securing the macroeconomic and financial stability in the ASEAN+3 region. With the signing of the MOU by Dean Akio Takahara and AMRO’s Director Dr. Junhong Chang, GraSPP and AMRO will pursue opportunities for cooperative research on issues of mutual interest, including such topics as cooperation on macroeconomic and financial stability of the region and macroeconomic surveillance to support the implementation of the Chiang Mai Initiative Multilateralization (CMIM). Both parties may cooperate not only by research but also by organizing joint events, promoting academic exchanges among experts and researchers from both sides, and joint publication of relevant academic works.